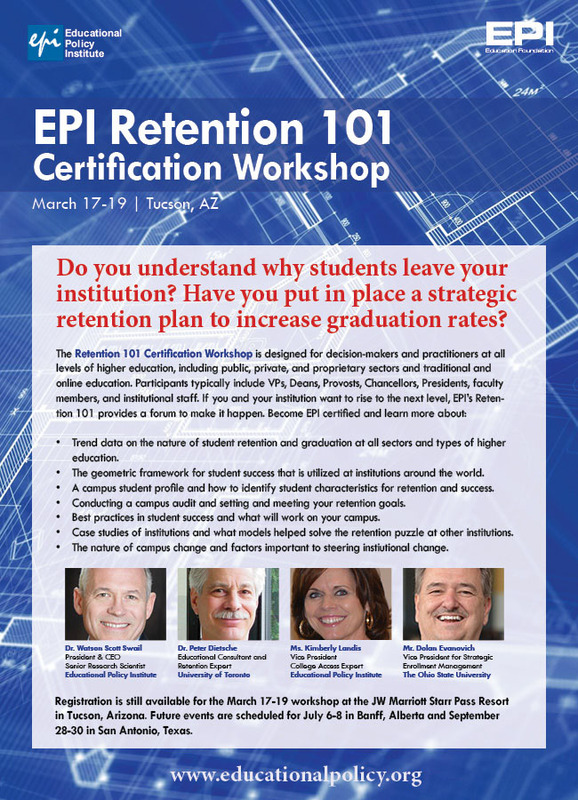 Eight years ago I wrote a piece for EPI’s Student Success Magazine titled “Seven Guiding Questions for Student Retention.” That seems ions ago, but people still come up to me and comment on that particular writing sample of mine. I came across it the other day and found that, for better or worse, the same rules apply today as they did in 2006. Not a surprise, but perhaps an indication that our work is so very difficult. I’m not one to regurgitate old work (I’d be an academic if that was the case), but I think this one is ready for a fresh read. Keeping students in school seems harder than it should be. Today’s students appear to be less prepared, have more emotional baggage, and have a different set of expectations than prior cohorts. It’s arguable whether any or all of this is true, but for the average campus professional, it seems so. Our ability to keep students in school is an important daily task on our campuses. Losing students, from an economic standpoint, is just bad business. Every student “lost” represents a financial loss for institutions. Institutions miss out on tuition and fees from that student, income from books and services, housing, and other revenue streams. In the long term, institutions, especially four-year undergraduate institutions, miss out on revenue from alumni contributions, which account for billions of dollars a year nationally. Of course, losses due to student attrition aren’t just realized on the institutional side. Students lose too. Students who dropout of the educational pipeline lose their initial fiscal investment and those who leave before completion of their program are more likely to hold significant debt loan and be less likely to repay those loans. Thus, they are prone to loan default. But perhaps the most important thing students lose is time. Students who leave school often lose valuable “life” time; time spent where little is gained. We understand that education has an opportunity cost to it, but we often forget that the cost is only repaid to those who complete their studies, not those who dropout. Thus, there is significant motivation for institutions and students to stay the course. Unfortunately, only half of fresh- man students who initiate their studies at a four-year institution leave with a BA in hand. The percentage at two-year institutions is far less. Not exactly uplifting, but that’s reality. The path to increasing student retention on campus is long and hard. To help you get your mind around the task ahead of you, here are seven questions that you need to consider. 1. Do you understand the nature of the problem? This isn’t as dumb as it sounds. The retention and persistence of students is a very complex issue. Simply knowing your cohort graduation rate isn’t good enough. You need to get at the heart of the problem through careful analysis of your entire student population. Work with your institutional research department to disaggregate the retention and persistence data of various populations on campus, including students of color, Pell-eligible students, students from certain geographic areas, resident vs. commuter students, et cetera. And remember that it isn’t only about persistence-to-degree rates. What do you know about the transfer process at your institution? Why are students transferring, and where is it they are transferring? 2. Do you know why your students leave? Ultimately, you need to know why students leave. There’s an entire body of literature about this topic, but ultimately you need to know why your students leave, not someone in an “average” institution in an “average” state. Exit interviews are your friend (say it over and over again and you’ll start to believe it. Really). These are extraordinarily important opportunities to capture information on why your students leave, and what role your institution plays in the departure process. Once you’ve collected and analyzed this information, then can you start asking questions about how you may better serve students. 3. Do you know what your institution is already doing to ameliorate these issues? Once you’ve identified the problem areas with regard to student retention, it is then necessary to audit or access current strategies on campus designed to ameliorate, or lessen, the dropout and stopout rates of students. Put it another way, if you don’t know what’s going on, how do you possibly know what to do? Take an opportunity to do a careful accounting of what the various departments on your campus are doing to support students. As you may imagine, this is extraordinarily difficult to do on a large campus (15,000+ student), but that doesn’t undercut the importance of this step. Hey, no one said this would be easy. 4. Do you know how effective these programs or strategies are? Step one is identifying the program and strategies. Step two is evaluating their effectiveness, which can be truly difficult and complex work. And for those who are really savvy, determining their cost effectiveness goes one step further. One strategy may be effective, but you must determine whether the benefit or impact outweighs the cost. In a constrained budget, this is an important issue. 5. Do you know what programs and strategies may be worth considering? In other words, have you done your research? Whether you are a key cog in the retention machinery or you are part of a campus team, information is your accomplice in changing campus mindsets and practices. Read some articles, check out a few books, and talk to your colleagues. These are some of the ways you can become more knowledgeable about student retention. Start by checking out the reading list at the end of this article and visiting our website (www.educationalpolicy.org). 6. Do you have evidence that there exists significant support on campus to do something about this issue? The one thing I’ve learned over the years is that institutional change only happens when faculty and leadership are supportive of the change. Both camps must realize that retention is an important issue, regardless of whether policymakers mandate performance measures. Faculty members are the closest to students, so they automatically become the key component of a retention program. Any change that takes place at the classroom level must involve faculty. At the other end, leadership must provide solid, unwavering support for the retention program and provide an air of trust and cooperation. When either side falls down, so do retention initiatives. 7. Do you understand the institutional change process? Building on the previous item, understanding how change occurs on campus is as important as understanding what you want to change. Leadership and faculty are the agents of change, but you and your col- leagues must understand what is involved in changing eons of practice. Let’s face it, higher education isn’t exactly known for its flexibility. Look at Peter Senge’s work or other authors, or bring in a consultant to help with the process. But know your change management. It’s a make-it-or-break-it deal. If you can answer each of these questions, you’re well on the road to success. If not, at least we’ve set your GPS for success. As I quipped in one of the questions, no one said this would be easy. And it’s not. Serving students is hard work; serving them well is harder. But for those of you who work on business terms, students are our clients and we owe it to them to provide them with the best opportunity for success. We can’t guarantee perfection for every student, nor can we promise success. But we can do what is in our control to maximize their opportunities on our campuses. Astin, Alexander W. (1997). What Matters in College: Four Critical Years Revisited. San Francisco, CA: Jossey-Bass. Kuh, George D., Kinzie, Jillian, Schuh, John H., Whitt, Elizabeth J., and Associates (2005). Student Success in College: Creating Conditions That Matter. San Francisco, CA: Jossey-Bass. Pascarella, Ernest T., and Terenzini, Patrick T. (2005). How College Affects Students. A Third Decade of Research. San Francisco, CA: Jossey-Bass. Senge, Peter (1994). The Fifth Discipline. The Art and Practice of a Learning Organization. New York, NY: Currency Doubleday. Swail, Watson S., and Redd, Kenneth, and Perna, Laura W. (2003). Retaining Minority Students in Higher Education: A Framework for Success. An ASHE-ERIC Higher Education Report. Volume 30, Number 2. San Francisco, CA: Jossey-Bass. Tinto, Vincent. (1993). Leaving College: Rethinking the Causes and Cures of Student Attrition (2nd Edition). Chicago, IL: The University of Chicago Press. Next Next post: Kicking the Common Core in the Teeth? Get a Life.